Using the latest CAD software we can assist customers with the development of complex bespoke designs to create finished tile cuts with a detailed plan to aid installation. With tolerances of +/- 0.25mm on material up to 30mm thick we are capable of producing parts to finished requirements. More Importantly we can provide a valuable service in the removal of material from thick plate or block, greatly reducing the time required for machining. At Aquajet we use the latest 3 dimensional CAD software to produce finished profile parts quickly and accurately, helping customers maintain tight deadline requirements. With the demise of mass production locally in this sector, the emphasis has switched to rapid prototype development. At Aquajet we can personally take you through the process of design to finished prototyping. 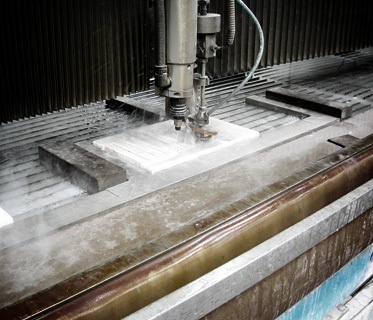 Waterjet cutting is ideal for producing foam or plastic packaging components, whether it be one-off bespoke designs or mass production. We are able to assist with the design process to enable customers to make maximum use of the cutting facility to create wonderful pieces of art or bespoke items. Situated in Coventry in the heart of the industrial Midlands, Aquajet offers a first class sub contract water jet cutting service through many industry sectors with ability to cut a vast array of material such as Steel, Copper, Aluminium, Brass, Stone, Marble, Porcelain and Ceramic tile, Wood, paper, Glass, Foam, Motor-sport and military Composites. All these can be cut up to 200mm thick on our flat bed machines. We also have robots for carrying out 6 axis profile cutting. So whatever industry sector your business operates in we have the knowledge and experience to assist. Offering unrivalled customer driven demands for quality, excellent reliable service and competitive pricing.